Brenspeed is an Indiana based tuning company that specializes on the Ford Mustang and their new 715R Boss 302 package increases the output of the mighty Boss Mustang from 444 horsepower and 380lb-ft of torque to a whopping 715 horsepower and 590lb-ft of torque. These big gains are achieved by adding a Roush R2300 TVS supercharger, a Roush TVS Cold Air Intake System, twin 60mm throttle body, an aluminum throttle body spacer, a high capacity and efficiency air-to-water intercooler system, a high flow fuel rail with 47-lb fuel injectors and an SCT X3 Tuner featuring the Brenspeed 715R engine calibration. This package also includes the other components to safely turn the 2012 and 2013 Boss 302 into the monster that you can see in the video below. When the Brenspeed 715R Boss 302 package was fitted up to the company shop car with a set of Kooks headers and high flow catalytic convertors (not included in the 715R package), the blown and tuned Boss made 631 wheel horsepower and 526lb-ft of wheel torque. That is more than 250 horsepower gained at the wheels over the stock 379hp made at the wheels. Brenspeed figures that this package with the exhaust upgrades increases the output into the range of 735 to 745 horsepower at the crankshaft so those who want more than 715 horsepower from their Boss 302 can have Brenspeed add that same exhaust package to squeeze out a few extra ponies. Brent of Brenspeed also points out that their 715R Boss 302 Mustang package is the BASE package and those Boss owners who want even more power can contact Brenspeed for more information – although the video points out that the Boss 302 with the Brendspeed 715R package will comfortably keep up with the likes of the mighty Shelby GT500 on a race track. Best of all, the Brenspeed 715R package for the 2012-2013 Ford Mustang Boss 302 costs just $7,402 (likely not including installation) so when you add that to the Boss MSRP of $42,200 – the 715R Mustang carries a price under $50,000. 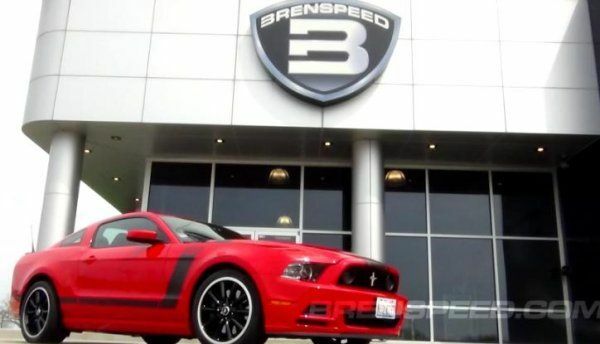 Compare that to the 2013 Shelby GT500 Mustang that carries an MSRP of $54,800 and “only” has 662 horsepower and you can see what a smoking hot deal Brenspeed has for owners of the modern Boss 302 who want to go really, really fast. The video below walks you through the ins and outs of the Brenspeed 715R Boss 302 Mustang package including some clips of the super tuned Boss in action on the dyno. Make sure that your speakers are cranked up as the Boss 302 sounds absolutely awesome as it puts down well over 600 horsepower to the wheels.